Do you base your characters on people you know, or wish to know? I always base my characters on people I know. In my novel, Standing On A Whale, some of my characters are based on aspects of my deeper self that have come to life, or should I say, that I have set free. The other characters are based on people who have had an impact on me. I believe that our characters already exist within us, the good, the bad, and the ugly. We just need to choose which ones we are ready to face and then allow them to surface. Once they are set free, they practically write the story for us and take us on adventures we may or may not be ready for, but if we trust in the process, the journey is worth it. I would have to say that Nikos Kazantzakis, the Greek writer and philosopher, has influenced me the most and continues to influence me today. His books: Zorba the Greek, Report to Greco, The Last Temptation of Christ, and The Greek Passion have had a great impact on me. As with a good film, I like to walk away from a book knowing that I am a better person for having read it. There is a heart and soul to Kazantzakis’s writing that draws me into deep contemplation and self-reflection. With each read, I walk away feeling that I have learned something new about myself. I did not know I was a writer until my editor sent me a five page editorial letter of affirmation on my first round of editing. I knew that I had presented her with the best manuscript I could muster, but I never expected to get such a positive review on the first run. Then, when I received my confirmatory Kirkus Review ten weeks after publishing, I grew wings. Those two confirmations gave me all of the confidence I needed to believe that a writer had been born. I am a self-help activist, so I read a lot of self-help books. I also read a lot of non-fiction books, which by the way, can help a writer add layers of interest to their stories. For example, if you are writing a story that takes place in a setting you are not familiar with, you can read research or travel books to help you find out about the weather patterns of that place, the flora and fauna, the type of people who live there, the geography and the terrain. Knowing facts adds authenticity to your work that is otherwise missing. I also read time-tested fiction and mythology because it helps me with pacing and rhythm. What is your genre and why? I have been told that my genre is psychological fiction. That is probably because I use fiction as a vehicle to carry ideas about philosophy, self-help, and psychology throughout my stories. It is sneaky perhaps, but it works. People get caught up in the plot and characters of your novel and suddenly they find themselves pondering the deeper questions of life, wondering what hit them. What is your writing philosophy? My steadfast philosophy is to write about what you know, what you have experienced – even the painful stuff. No one can describe your experiences like you can. You were there and that is what gives it raw energy. The reader can feel that energy because it has a ring of authenticity to it. It is hard work for me to write about anything outside of myself. How long did it take you to write this first book? Actually, this is not my first book, but my third. It took eleven years to complete it, because I was also working on two non-fiction manuscripts intermittently. It was only because my heart kept drawing me back to Standing On A Whale, that it won the race and became my first published work. I am glad that it took eleven years to finish it though, because during that time each of my characters had time to be born, experience a raucous adolescence, and progress into maturity. My characters became three-dimensional during those eleven years and it was very hard to leave them in the end. I never once felt like I was writing a book; I was simply allowing a story to unfold. How did you come up with the idea and title of the book? The original idea for this novel was not fully realized. Initially, I had envisioned a story based on someone I knew who had made an immaculate transformation out of his wretched life because someone rescued him and changed his life forever. Suicide was not an underlying premise during the early years of this novel. It was when two of my students confided in me some dark plans of their own that I became consumed with suicide and the theme immediately entered into my protagonist. I suppose it was my way of dealing with the pain that I felt over the situation. Being a teacher is a revelation these days. There are a lot of young people hurting out there and that is troubling to me. 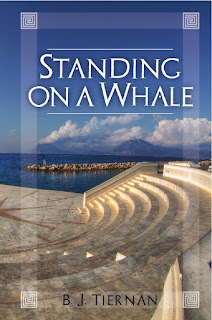 The title for Standing On A Whale changed three times while I was working on it. The first title was The Crystal Mystic and the second was Stage Whisper. As with everything else I have experienced in the writing process, things change repeatedly and usually when you are not looking. By accident, if you believe in such a thing, I stumbled upon a quote, “standing on a whale, fishing for minnows.” I researched it further and found it to be a Polynesian philosophy and metaphor that captured every element of my novel. I adore metaphors, so I changed the title immediately. P.S. My editor agreed. She said it was the perfect title for this book. Do you have any current works in progress? I do, but these books are not fiction. One is called Sleeping Through A Crisis and the other is called Lace On Fire. I do intend to edit them and possibly publish both books, but timing is everything and right now I am fully dedicated to promoting Standing On A Whale. I believe in its message. 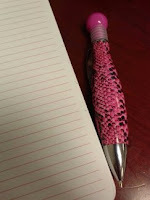 The writing process itself inspires me to write. I follow three simple rules: Show up at the page. Allow no excuses. Write with abandon. A writer must intentionally carve out a slice of time each day to write, even if only for ten minutes. That discipline is mandatory. Once you show up, inspiration shows up. For me, it works every time. Do you have any stories about the writing process? I do. I call it my “Sprout Story.” When my manuscript was completed, I didn’t know what to do with it. Along the way, I had taken a serious swim or two hundred with the sharks, also known as literary agents, to see if anyone was interested. I received numerous rejections, encouragements, and redirections, but no solid offers for over two years. I couldn’t seem to master the unforgiving Query Letter and was tired of trying to figure it out. 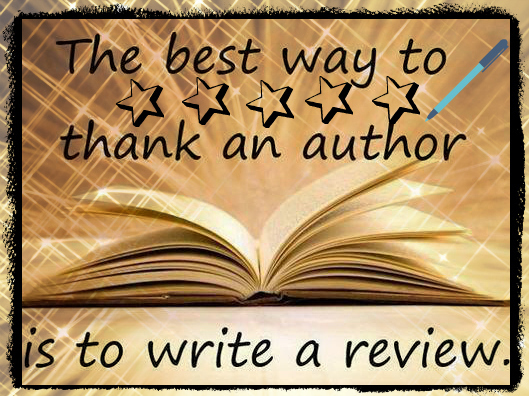 I was amazed that I could write a sprawling novel filled with characters, plots, and twists, but when it came to describing my own story in a few vivid paragraphs to hook an agent, I failed miserably. I love those agents; they really do know their stuff. Each rejection forced me to improve my story by editing it further. Had any one of those rejection letters been an acceptance letter, Standing On A Whale would not have matured into what it was meant to become. Everything in life commands patience. When the seed is ready, the sprout will appear. The hardest thing about writing a book for me is being patient with the process. A good book takes time to develop because we are developing every day, along with our work. We change constantly and those changes filter into our stories and give depth and dimension to our plots and characters. If we are constantly being pulled out of our writing by thoughts of rushing to finish our book, getting it accepted by a publisher, and becoming the next famous author, not much will happen. This post originally appeared on My Writing Self. Don't miss seeing B.J. Tiernan in person. She will be talking about her book, Standing on a Whale, and answering questions. 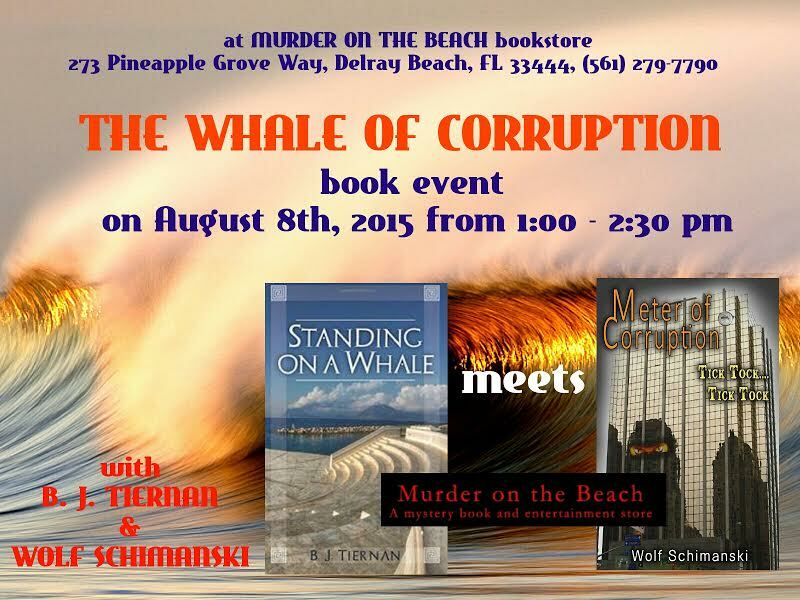 Her book event is on Saturday, August 8th at Murder By The Beach Bookstore, in Delray Beach, Florida, from 1 pm to 2:30 pm. "B.J. Tiernan is a teacher. It’s her calling. 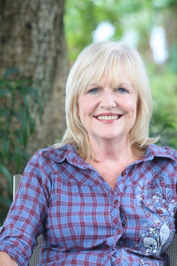 She's been at it since graduating from the University of Florida with a degree in education in 1972. Whether it is in the classroom or through her writing, it is what she loves to do. Throughout the years, she has given numerous seminars, inspirational workshops, and classes to promote self-growth and writing skills. For the past fifteen years, she has been putting her certification in social sciences to work teaching world history and ancient cultures to sixth graders. She has also taught several creative writing classes at Community Schools in Broward County. She writes contemporary fiction that causes the reader to think, to ponder, to question. Through the back door of fiction, she addresses questions about living, dying, and the age-old task of overcoming our dark side. One of her biggest joys has been to design and teach a course for adults at Community School, where individuals can shine a light on their own memories and experiences and organize them into stories. One of her student’s short stories was published in Chicken Soup for the Soul—Family Matters. Tiernan dedicates Standing on a Whale to all of her students who have passed through her classes and workshops hungry to learn and write".